↑ "1945: Atom bomb hits Nagasaki". ↑ Hakim, Joy (1995). A History of Us: War, Peace and all that Jazz. New York: Oxford University Press. আইএসবিএন ০-১৯-৫০৯৫১৪-৬. 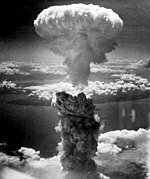 ↑ "1945: Atom bomb hits Nagasaki". BBC News. August 9, 1945. Retrieved May 2, 2010. ↑ Cook, Haruko & Theadore (1992). Japan at War: An Oral History. New York: The New Press. আইএসবিএন ০-৭৩২২-৫৬০৫-৪.